حجابی, سمیه, بذرافشان, جواد, ایران نژاد, پرویز, عراقی نژاد, شهاب, قادر, سرمد. (1397). کاربرد طرح‌واره برهمکنش جو- سطح خشکی (ALSIS) در شبیه‌سازی جریان رودخانه با تأکید بر ناهمگنی مکانی سطح خشکی در مقیاس زیر یاخته‌ای (مطالعه موردی: حوضه کرخه). 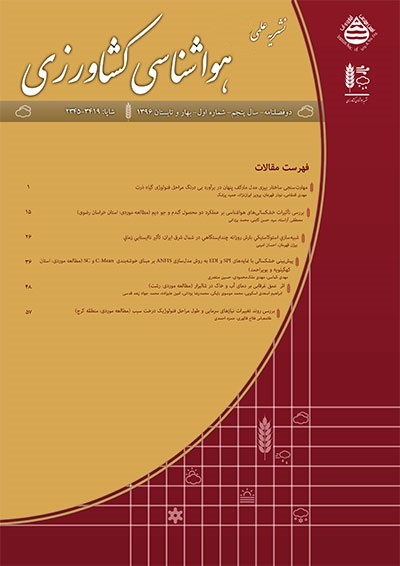 هواشناسی کشاورزی, 6(2), 13-29. doi: 10.22125/agmj.2019.113711. سمیه حجابی; جواد بذرافشان; پرویز ایران نژاد; شهاب عراقی نژاد; سرمد قادر. "کاربرد طرح‌واره برهمکنش جو- سطح خشکی (ALSIS) در شبیه‌سازی جریان رودخانه با تأکید بر ناهمگنی مکانی سطح خشکی در مقیاس زیر یاخته‌ای (مطالعه موردی: حوضه کرخه)". هواشناسی کشاورزی, 6, 2, 1397, 13-29. doi: 10.22125/agmj.2019.113711. حجابی, سمیه, بذرافشان, جواد, ایران نژاد, پرویز, عراقی نژاد, شهاب, قادر, سرمد. (1397). 'کاربرد طرح‌واره برهمکنش جو- سطح خشکی (ALSIS) در شبیه‌سازی جریان رودخانه با تأکید بر ناهمگنی مکانی سطح خشکی در مقیاس زیر یاخته‌ای (مطالعه موردی: حوضه کرخه)', هواشناسی کشاورزی, 6(2), pp. 13-29. doi: 10.22125/agmj.2019.113711. حجابی, سمیه, بذرافشان, جواد, ایران نژاد, پرویز, عراقی نژاد, شهاب, قادر, سرمد. کاربرد طرح‌واره برهمکنش جو- سطح خشکی (ALSIS) در شبیه‌سازی جریان رودخانه با تأکید بر ناهمگنی مکانی سطح خشکی در مقیاس زیر یاخته‌ای (مطالعه موردی: حوضه کرخه). هواشناسی کشاورزی, 1397; 6(2): 13-29. doi: 10.22125/agmj.2019.113711. در این مطالعه، کاربرد طرح‌واره برهم‌کنش جو- سطح خشکی (ALSIS) در شبیه­ سازی جریان رودخانه در حوضه آبریز کرخه مورد بررسی قرار می­ گیرد. از داده­ های شبکه ­بندی شده پایگاه داده ­های بازتحلیل سامانه پیش ­بینی اقلیم (CFSR) برای دوره 1982-2011 به عنوان داده‌های واداشت جوی استفاده شده است و پیاده‌سازی اثرات ناهمگنی در مقیاس زیر­یاخته ­ای مبتنی بر تقسیم یاخته­ های شبکه به موزائیک‌های خاک-پوشش گیاهی است. برای مدلسازی جریان پایه از مدل آبشار مخازن خطی و برای روندیابی رواناب از یک مدل روندیابی جریان در پیوند با طرح‌واره سطح خشکی استفاده شده است. مقایسه جریان شبیه ­سازی شده و مشاهده شده در شش ایستگاه هیدرومتری در سطح حوضه کرخه حاکی از توانایی خوب طرح‌واره در شبیه­سازی جریان ماهانه رودخانه است. به علاوه، مدل توانایی خوبی در شبیه‌سازی رژیم ماهانه مؤلفه ­های ترازمندی آب، توزیع مکانی میانگین بلندمدت مؤلفه‌ها و رابطه بین آن‌ها دارد. This study evaluates the application of Atmosphere-Land Surface Interaction System (ALSIS) scheme in simulating the streamflow in Karkheh river basin. The Climate Forecast System Reanalysis (CFSR) data for the period 1982-2011 are used as atmospheric forcing data and sub-grid scale heterogeneity of the land-surface is represented by soil-vegetation mosaics. The cascade of linear reservoirs model is used for modelling the base flow and a routing model, linked to the land surface scheme, is used for modelling river discharge. The comparison of simulated and observed streamflow in six hydrometric stations over Karkheh basin reveals the model ability in simulating the monthly streamflow. Moreover, the model has a good ability in simulating the monthly regime of water balance components, spatial distribution of long-term average of components and their relationships. Arnell, N. W. 1995. River runoff data for the validation of climate simulation models. Oliver, H. R., Oliver, S. A. (Eds. ), The Role of Water and the Hydrological Cycle in Global Change. Springer, pp. 349-371. Arnold, J. G., Srinivasan, R., Muttiah, R. S., Williams, J. R. 1998. Large area hydrologic modeling and assessment part I: Model development. Journal of American Water Resources Association, 34(1): 73–89. Avissar, R., Pielke, R.A. 1989. A parameterization of heterogeneous land surfaces for atmospheric numerical models and its impact on regional meteorology. Monthly weather review, 117(10): 2113-2136. Bai, P., Liu, X., Yang, T., Liang, K., Liu, C.H. 2016. Evaluation of streamflow simulation results of land surface models in GLDAS on the Tibetan plateau. Journal of Geophysics Research, 121(20): 12180-12197. Beven, K. J., Calver, A., Morris, E. M., 1987. The Institute of Hydrology Distributed Model. Institute of Hydrology Report 98, Wallingford, UK. Broadbridge, P., White, I. 1988. Constant rate infiltration: a versatile non- linear model. 1. Analytic solution. Water Resources Research, 24: 145-154. Brooks, R.H., Corey, A.T. 1966. Properties of porous media affecting fluid flow. Journal of Irrigation and Drainage Division, 92(2): 61-90. Campbell, G.S. 1985. Soil Physics with Basic: transport models for soil-plant systems. Elsevier, New York, pp. 149. Clapp, R.B., Hornberger, G.M. 1978. Empirical equations for some soil hydraulic properties. Water Resources Research, 14: 601-604. Davtalab, R., Mirchi, A., Khatami, S., Gyawali, R., Massah, A., Farajzadeh, M., Madani, K. 2017. Improving Continuous Hydrologic Modeling of Data-Poor River Basins Using Hydrologic Engineering Center’s Hydrologic Modeling System: Case Study of Karkheh River Basin. Journal of Hydrologic Engineering, 22(8): 1-13. Giorgi, F. 1997. An approach for the representation of surface heterogeneity in land surface models. Part I: Theoretical framework. Monthly weather review, 125(8): 1885-1899. Giorgi, F., Avissar, R. 1997. Representation of heterogeneity effects in earth system modeling: Experience from land surface modeling. ‎Reviews of Geophysic, 35(4): 413-437. Hansen, M., DeFries, R., Townshend, J.R., Sohlberg, R. 1998. UMD global land cover classification, 8 kilometers, 1.0. Department of Geography, University of Maryland, College Park, Maryland. Irannejad, P. 1999. Impact of land surface scheme structure on the prediction of soil moisture and surface energy fluxes. University of New South Wales. Irannejad, P., Shao, Y. 1998. Description and validation of the atmosphere- land-surface interaction scheme (ALSIS) with HAPEX and Cabauw data. ‎Global Planetary Change, 19: 87-114. Irannejad, P., Shao, Y. 2002. Land Surface Processes, Peng, G., Leslie, L. M., Shao, Y. (Eds. ), Environmental Modelling and Prediction, Springer, pp 173-213. Koster, R. D., Suarez, M.J. 1992. Modeling the land surface boundary in climate models as a composite of independent vegetation stands. ‎Journal of Geophysic Research, 97(3): 2697-2715. Liang, X., Lettenmaier, D. P., Wood E. F., Burges, S. J. 1994. A simple hydrologically based model of land surface water and energy fluxes for general circulation models. Journal of Geophysic Research, 99(7): 14415–14428. Lohmann, D., Lettenmaier, D. P., Liang, X., Wood, E.F., Boone, A., Chang, S., Chen, F., Dai, Y., Desborough, C., Dickinson, R.E., Duan, Q., Ek, M., Gusev, Y.M., Habets, F., Irannejad, P., Koster, R., Mitchell, K.E., Nasonova, O.N., Noilhan, J., Schaake, J., Schlosser, A., Shao, Y., Shmakin, A.B., Verseghy, D., Warrach, K., Wetzel, P., Xue, Y., Yang, Z.L., Zeng, Q.C. 1998a. The Project for Intercomparison of Land-surface Parameterization Schemes (PILPS) phase 2 (c) Red–Arkansas River basin experiment: 3. Spatial and temporal analysis of water ﬂuxes. Global Planetary Change, 19(1): 161– 179. Lohmann, D., Nolte Holube, R., Raschke. E. 1996. A large-scale horizontal routing model to be coupled to land surface parametrization schemes. Tellus, 48: 708-721. Lohmann, D., Raschke, E., Nijssen, B., Lettenmaier, D.P. 1998b. Regional scale hydrology: II. Application of the VIC-2L model to the Weser River, Germany. Hydrological Science Journal, 43(1):143-158. Muthuwatta, L.P., Booij, M.J., Rientjes, T.H.M., Bos, M.G., Gieske, A.S.M., Ahmad, M. 2009. Calibration of a semi-distributed hydrological model using discharge and remote sensing data, Yilmaz, K., Yucel, I., Gupta, H.V., Wagener, T., Yang, D., Savenije, H., Neale, C., Kunstmann, H., Pomeroy, J. (Eds. ), News approaches to hydrological prediction in data sparse regions. IAHS Press, pp. 52-58. Nash, J.E. 1958. The form of the instantaneous unit hydrograph. IAHS Publ., 45: 114-121. Nijssen, B., Schnur, R., Lettenmaier, D.P. 2001. Global retrospective estimation of soil moisture using the variable infiltration capacity land surface model, 1980–93. ‎Journal of Climate, 14(8): 1790-1808. Redinger, G.J., Campbell, G.S., Saxton, K.E., Papendick, R.I. 1984. Infiltration rate of slot mulches: measurement and numerical simulation. Soil Science Society of America Journal, 48: 982-986. Reed, S.M., Koren, V.I., Smith, M., Zhang, Z., Moreda, F., Seo, D.J. 2004. Overall distributed model intercomparison project results. Journal of Hydrology, 298(1): 27-60. Saha, S., Moorthi, S., Pan, H.L., Wu, X., Wang, J., Nadiga, S., Tripp, P., Kistler, R., Woollen, J., Behringer, D. 2010. The NCEP climate forecast system reanalysis. Bulletin of American Meteorological Society, ‎91(8): 1015. Shi, Y. 2012. Development of a land surface hydrologic modeling and data assimilation system for the study of subsurface-land surface interaction. The Pennsylvania State University. Singh, V., Woolhiser, D. A. 2002. Mathematical modeling of watershed hydrology. Journal of Hydrologic Engineering, 7(4): 270–292. Smith, M. B., Seo, D.J., Koren, V. I., Reed, S.M., Zhang, Z., Duan, Q., Moreda, F., Cong, S. 2004. The distributed model intercomparison project (DMIP): motivation and experiment design. Journal of Hydrology, 298(1): 4-26. Tang, C., Piechota, T.C. 2009. Spatial and temporal soil moisture and drought variability in the Upper Colorado River Basin. Journal of Hydrology, 379(1): 122-135.
van Genuchten, M.T.H. 1980. A close-form equation for predicting the hydraulic conductivity of unsaturated soils. Soil Science Society of America Journal, 44: 892-898. Wieder, W., Boehnert, J., Bonan, G., Langseth, M. 2014. Regridded Harmonized World Soil Database v1. 2, Data set. Available on-line [http://daac. ornl. gov] from Oak Ridge National Laboratory Distributed Active Archive Center, Oak Ridge, Tennessee, USA. Wood, E.F., Lettenmaierb, D.P., Liang, X., Lohmann, D., Boone, A., Chang, K.S., Chen, F., Dai, Y., Dickinson, R.E., Duan, Q., Ek, M., Gusev, T.M., Habets, F., Irannejad, P., Koster, R., Mitchel, K.E., Nasonova, O.N., Noilhan, J., Schaake, J., Schlosser, A., Shao, Y., Shmakin, A.B., Verseghy, D., Warrach, K., Wetzel, P., Xue, Y., Yang, Z.L., Zeng, Q.C. 1998. The Project for Intercomparison of Land-surface Parameterization Schemes (PILPS) Phase 2(c) Red–Arkansas River basin experiment: 1. Experiment description and summary intercomparisons. ‎Global Planetary Change, 19(1): 115–135. Wu, Z., Lu, G., Wen, L., Lin, C.A., Zhang, J., Yang, Y. 2007. Thirty five year (1971–2005) simulation of daily soil moisture using the variable infiltration capacity model over China. Atmosphere-ocean, 45(1): 37-45. Yang, Z. L. 2004. Modeling land surface processes in short-term weather and climate studies. World Scientiﬁc Series on Meteorology of east Asia, Zhu, X., Li, X., Cai, M. Zhou, S. Zhu, Y., Jin, F.-F., Zou, X., Zhang, M. (Eds. ), World Scientiﬁc, New Jersey, pp. 288–313. Yeh, G. T., Huang, G. B., Cheng, H. P., Zhang, F., Lin, H. C., Edris, E., Richards. D. 2006. A ﬁrst-principle, physics-based watershed model: WASH123D. Singh, V. P., Frevert, D. K. (Eds. ), Watershed Models, CRC Press, Boca Raton, Florida, pp. 211–244. Zhang, B., Wu, P., Zhao, X., Wang, Y., Gao, X., Cao, X. 2013. A drought hazard assessment index based on the VIC–PDSI model and its application on the Loess Plateau, China. ‎Theoretical and Applied Climatology, 114(1): 125-138. Zhu, Z., Bi, J., Pan, Y., Ganguly, S., Anav, A., Xu, L., Samanta, A., Piao, S., Nemani, R.R., Myneni, R.B. 2013. Global data sets of vegetation leaf area index (LAI)3g and Fraction of Photosynthetically Active Radiation (FPAR)3g derived from Global Inventory Modeling and Mapping Studies (GIMMS) Normalized Difference Vegetation Index (NDVI3g) for the period 1981 to 2011. ‎Rem. Sens., 5(2): 927-948.